64 pages, 8.5" x 11"
In words, diagrams, and action photographs, Joe Louis—who was named the greatest heavyweight champ of all time by the International Boxing Research Organization in 2005—explains the techniques he successfully used in his boxing career. There can be no greater authority to write a book on this subject than the "Brown Bomber," who held the World Heavyweight Championship for 11 years and successfully defended the title 25 times, both heavyweight records. Paladin Press is pleased to offer this classic old-school boxing title, which was originally published in 1948, to a whole new generation of enthusiasts eager to learn boxing. Starting with the correct mental attitude and basic training rules and equipment, the book proceeds through the proper stance and footwork to all the various punches and knockout blows. Personal experiences and pictures of the legendary champ enliven the instructions and lessons. 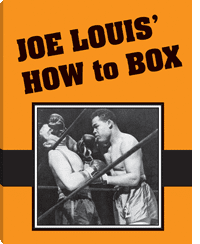 Joe Louis' How to Box is for anyone interested in learning more about Joe Louis or boxing for self-defense.